Being from Baltimore City I love the city of my birth so many fond memories growing up in East Baltimore. 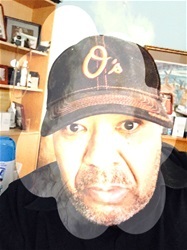 Oh, I do have just as many nasty memories but I have begun to focus my attentions on the positive aspects of Baltimore City as I age, day by day. So, beginning midnight Friday, August 4, 2017, through Monday 2:00 AM, August 7, 2017. 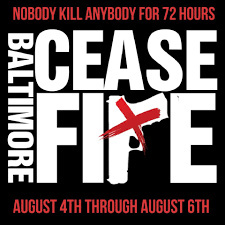 Let's have an entire weekend without filling a body bag through an act of violence by gunfire, or any other act of violence in any of the Black communities in and around Baltimore City. No murders on the Eastside, Westside, Southside, or Northside of Baltimore this weekend. We've simply buried way too many bodies in the past decade. Let's go beyond the bullet for the solution to our issues with one another. No issue can be solved if you or your alleged enemy are buried in a grave. Especially considering both of you are facing the same societal injustices that contribute to the acts of violence. I truly understand that the criminal elements of the city control most of the facts, or circumstances behind these many murders. Murders which have caused so much suffering and loss in our Baltimore communities. So shake up that bucket of distrust that currently exists amongst each in these elements and identifies levels of trust and hope that can forge a lasting brotherhood. We can indeed together start to rebuild our broken cities collectively beginning this weekend. If you have a corner beef with a perceived threat counter that beef with words of commonality, not lead bullets of destruction. If someone unknown to you steps on your turf, why not put out a hand of friendship, rather than a loaded Glock filled rage and hatred? Rather than challenge someone's manhood with loaded guns put out a chess board, or a physical challenge to settle misunderstandings. Or better yet put on a soulful music and harmonize. You may create something special rather than participate in something treacherous. So, Baltimore City the choice is yours this weekend. You can continue to disrupt and confuse or plan and agitate for change together. I remember the moves in Baltimore for human decency in the 1970's let's bring those attitudes back with the richness that is in all of us. If Baltimore City can achieve this small but notable accomplishment. So can every urban city in this nation. We can turn a weekend in a week, a week into a month, and a month into a year collectively together.